We’re excited because the lovely E-Side (our luxury eco & sustainable design retailer client) has had one of it’s dead cool products featured in the December issue of Grand Designs. 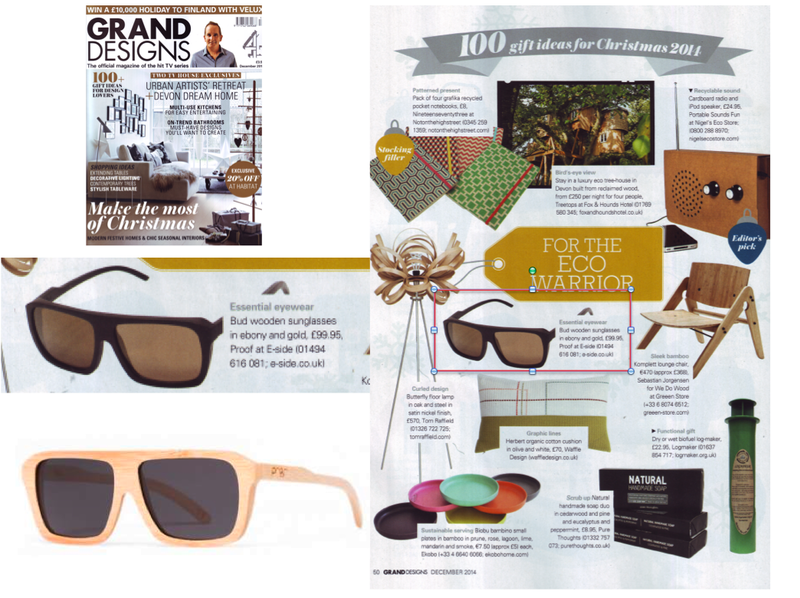 US label Proof’s stylish sustainable wooden sunglasses have been cited as a great Christmas gift for the “Eco Warrior”. Know of a stylish and earth-conscientious soul who’d love one of these bad boys? Individually handcrafted and rendered in a variety of beautiful, eco-friendly woods such as ebony and bamboo, Proof’s unisex shades look classically cool and also contribute to a good cause. For every pair you buy, a portion of the sale price goes to supporting charitable causes and projects worldwide, including an eye clinic in a rural, underserved area of India.